The dawn of a new year inspires hope, optimism, and for many people, a renewed resolve to do something better than we did it the year before. The ambition to do better and be better can be a good thing. And yet, we have a tragic history of being self-centered, self-serving, and self reliant. We use our God-given strength to erect man-centered Babel-like fortresses to parade our greatness until God humbles us, scatters us, and graciously wakes us up to the reality of who we really are. We are dependent, corrupted creatures who desperately need the powerful intervention of Jesus Christ. As followers of Jesus, we are those who do not proclaim our own greatness or strength, but who boast in our God who demonstrates his sufficiency in the midst of our weaknesses. In passages like Paul’s prayer for the Colossians in 1:9-12, we see that Paul knew that we are all dependent on God to lead, strengthen, and empower us. We express our dependence on God in prayer and in our worship. What better way to begin a new year than by singing a hymn that so clearly and beautifully expresses dependence on God? When we sing Be Thou My Vision, we make it public that we are utterly dependent on God to be our vision, our focus, our wisdom, our Father, our inheritance, and our King. January 1st does not give us new strength from ourselves. As we look for the power to follow Jesus, let’s not search the not-so-deep-depths of our weak, proven-track-record-of-failing selves. No–every year and every day, let’s keep casting ourselves on the all sufficiency of our gracious king to be our vision–until that glorious day when we reach heaven’s joys and behold bright Heav’n’s Sun. Chances are you know this hymn already. If it’s helpful to you, please use our YouTube channel to hear it so you can sing it with confidence. We’ve added several versions of the hymn to the top of our playlist for you to choose from. And don’t forget our free printable lyrics, music, and a copywork page to help you along. 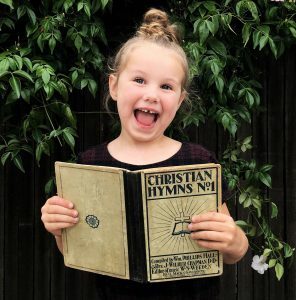 We encourage you all to gather up your families, for just a few minutes each day, to sing, discuss and memorize this hymn, whether it is during family worship, or before bedtime – whatever works best for your family. By the end of January, you are encouraged to post either a photo or video inspired by the song. Every time you post, you will be entered into a drawing for a little something special. Just tag your post with #hymnofthemonth. If you have any questions, please don’t hesitate to ask! Let us know if you’ll be joining in!